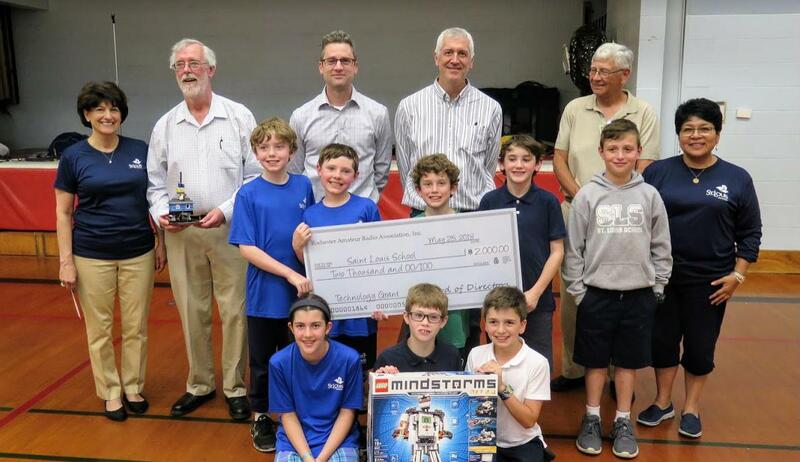 The Rochester Amateur Radio Association awarded its 2018 Technology Grant to St. Louis School, Pittsford, NY on May 25. The $2000 grant will be used to purchase four Lego EV3 Robotics Kits. The kits will be used to prepare students to compete in the 2018 FIRST Robotics Competition. FIRST engages kids in kindergarten through high school in exciting, mentor-based, research and robotics programs that help them become science and technology leaders, as well as well-rounded contributors to society. The purpose of the RaRa Technology Grant is to provide funding for educational projects and specific equipment needs in the STEM fields of electronics and radio communications with emphasis on youth-based activities. This grant is one of the many ways that RaRa fulfills its mission to “promote scientific education and knowledge of radio engineering and communication skills by facilitating the exchange of information, improving individual operating efficiency and strengthening the welfare of amateur radio in the community”. St. Louis Catholic School is a faith–and values–centered community dedicated to providing academic excellence for children in preschool through grade 5. St. Louis School, in partnership with families and the community, strives to provide students with experiences that encourage individuality and the development of mind, body and spirit. St. Louis School has a recognized STEM program. Please note: Updated information and availability for the 2019 Grant will be added to this page this fall. RaRa members are proud to support educators in the Rochester area with grant funds STEM fields of electronics and radio communications with emphasis on youth-based activities. To provide funding for educational projects and specific equipment needs that promote practical applications in the STEM fields of electronics and radio communications with emphasis on youth-based activities. Non-profit schools K through 12 located in New York counties of Monroe, Orleans, Wayne, Genesee, Livingston, Ontario, Allegany, or Steuben. Award amounts vary and will be based on the application and resources available at the time of application, not to exceed $2,500.00. Grant monies shall be applied no less than 90% to tangible equipment, of which no less than 75% shall have a life expectancy greater than 5 years. Applications must be submitted by March 31st of each year. Grant Allocation decisions will be made by May 31st of each year. Projects should be completed within one year of funding. If a project cannot be completed in one year, the application must explain the special circumstances that support a longer cycle. Projects that are funded must complete a grant report at 6 months and again at year end that outlines the outcomes and accomplishments of the project and whether all goals and objectives were met. or leave a message at: 585-210-8910.